Our primary job is custom slaughtering for farmers who bring in their cattle, hogs, goats and sheep for personal use. Because our plant is USDA Inspected, our standards must be higher and everything must be cleaner than a plant that is custom only. Customers tell us repeatedly that this is the cleanest slaughter house they've ever been in. We make sure that you get your meat and all of it. We prepare your order as if it were our own. We are complemented often for this work ethic. We strive to bring you the best in quality service, and if something isn't right, please let us know. We make appointments Monday-Thursday and lately we've stayed booked for 5+ months in advance. We also have local BEEF, PORK, & LAMB that we slaughter and process here and sell in any quantity... a single pack... or a whole beef or hog. We have a USDA Meat Inspector on site that inspects and approves the meat that we sell. This is the same process that all meat goes through in the grocery stores, but this is FRESH, LOCAL, and grain fed. We DO NOT process YOUR livestock for resale. In other words... If you want to resell YOUR meat in a retail market, we DON'T perform that service. The meat we sell is from local farms. It has no growth hormones or any medications. You only get 100% meat, no additives. They are all grain fed before slaughter to achieve the maximum flavor and tenderness. 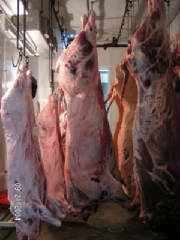 We sell Beef, Pork and Lamb cuts. Everything is packaged and frozen. It can be seen and bought in the office freezer. You can bring in your own cattle, hogs, goats, or lambs and we will process them for you. 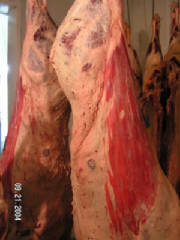 We handle custom orders with the same care we use for our USDA Inspected meat... without all the gov't paperwork! We process deer. Same as last year: each deer will be $90 or $105 if you want the head and hide back for mounting. When you pickup, there is a $5 discount for cash. We have a 24 hour dropoff room that is supplied with blank tags and markers. It has an AC unit to keep everything cool. Our entire property is monitored with cameras and a security system. Most deer meat are ready to be picked up within 2-3 days. In order to continue to receive all deer, orders MUST be picked up quickly so it doesn't fill up the freezer. We DO NOT handle or process ANY WILD HOGS OR BEARS.